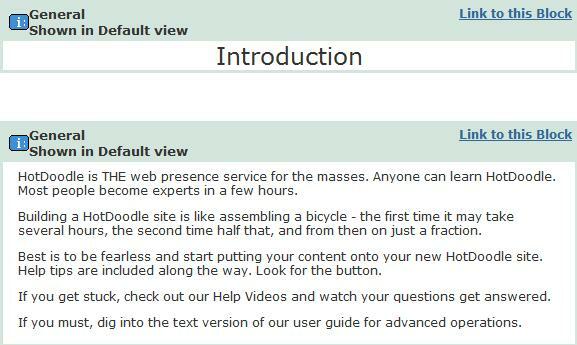 The General Block allows you to place and edit text, images and links. It is the most commonly used HotDoodle Block type. Click the edit doodle icon, relative to the General Block you wish to modify. A simple text editor will open allowing you to insert or edit text. In the text editor window, a pull-down menu will be present with various options to modify font style or size. These menu options should look familiar to you from your word processing software, such as the bold, italic, and underline icons. Other options include adding bulleted lists and modifying text color, text background color, and text alignment. Once text has been inserted or configured, press the Save button. Note: Choices of fonts and font sizes are based on the cascading style sheet web standard. To insert a link into text or an image first requires the text or image to be highlighted. Once highlight, click the link icon. A pop-up window will appear where the link destination is to be specified. If you are linking to content outside your HotDoodle site, then supply the URL in the "Manually enter address" field. If you are linking to content within your HotDoodle site, then select "link to a page,” which will result in a pop-up window displaying a list of pages within your site. Select from a destination within your Site Hierarchy. 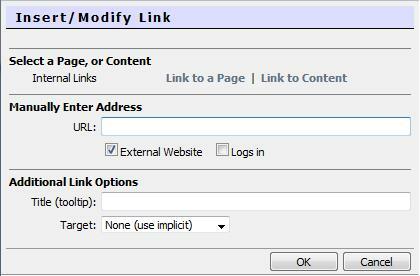 If you are wishing to link to a specific location on a page within your HotDoodle site, then select "Link to Content." A pop-up window will appear with blocks marked with a "link to this block" link. Selecting a link will make that particular block the destination on the specified destination page. Using the General Block, images can be inserted among text. Images can be sourced from an internal link, external link, or your HotDoodle image library. Lower resolution images are best suited for web pages due to page loading time and monitor capabilities; high resolution images are typically used for print. In order to be visible on the web, images must be live on a web server. Images can be sourced from your computer or other storage services. In addition, HotDoodle provides the option to stores images on its image manager module. Images larger than 2 Megabytes (2000 Kilobytes) may fail to upload due to limitations in web browsers and web servers.